The first hallmark of Zegna fabrics was a star. It started to shine in Trivero in 1929. Chef Ermenegildo Zegna found himself in one of those situations where you have to decide whether to focus on reliable, tried and tested recipes that will no longer amaze people, or risk losing fond customers by innovating to please the tastes of the whole world. This happens to top chefs too. The phenomenal types, like Bocuse, abandon the old for the new: hence the Michelin stars. Put simply, Ermenegildo Zegna is in a pretty fortunate situation: he doesn’t have to change his fabrics (the market isn’t telling him to), he can’t change them anyway (the national and international markets aren’t favorable – it’s the year of the Wall Street Crash let’s not forget...) and above all he doesn’t want to (he’s already top of the range). Yet he knows he should change something. He’s aiming at the first star (there are five now). So he uses a star. What he "invents" is a different perception of the product to offer by way of the brand. The first. The first trademark not only for Zegna but for all the wool mills in the kingdom of Italy. Electa: a strong, Italian brand. A clear and noble narrative (between the antiquity of the Latin name and the Florentine renaissance of the Agnus Dei in the star) and above all new for a product (fabric) that till then had spoken only English, or dared not speak at all. Electa was not a fabric, not a line: it was Zegna production offering itself on the market with unprecedented recognizability, with no inferiority complexes and with every intention to prove that the gap with Great Britain had become very narrow and could be bridged in the short term (as in fact happened on the threshold of the last war). Electa Fratelli Zegna di Angelo was filed and registered as a national trademark in 1929 (14 November) and as an international trademark in 1930. It was applied by gluing and ironing onto the fabric. It consists of a 5-point star with the Mystic Lamb at the center with an aureole and banderole (ie. the scroll that normally bears the wording Ecce Agnus Dei in a religious context) and the initials “F Z A” in the star’s three upper points, forming a crown. The sheep looks like a merino and is in the style already being used by Florentine wool weavers who had made it the emblem of the Art of Wool (it can also be seen on Giotto’s bell tower). The choice of the word Electa was in line with the then current practice of using Latin for proudly national advertising of Italian products. The term refers to something “chosen, elevated”, thus indicating prestige, excellence. It was used not only to brand textiles but also in advertising campaigns in trade magazines (eg. "Arbiter"), accompanied by a graphic or photographic image of the Trivero wool mill. 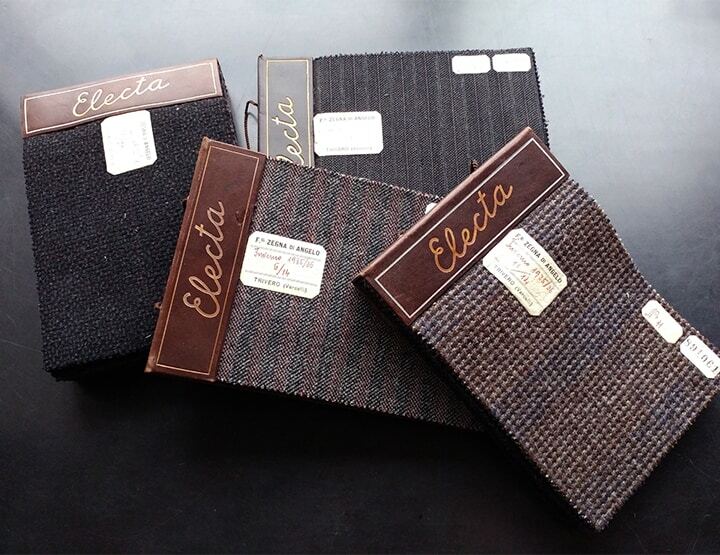 To see some Electa fabrics, one need only browse through a sample book for 1930 or a bunch from one of the years just before or just after. The types do not differ from those of the 1928 seasons, nor from those of the early Thirties. The weights and finishings are the same too. The main weave was the casimir, a twill, an apparently simple weave, the most classic for drapery. 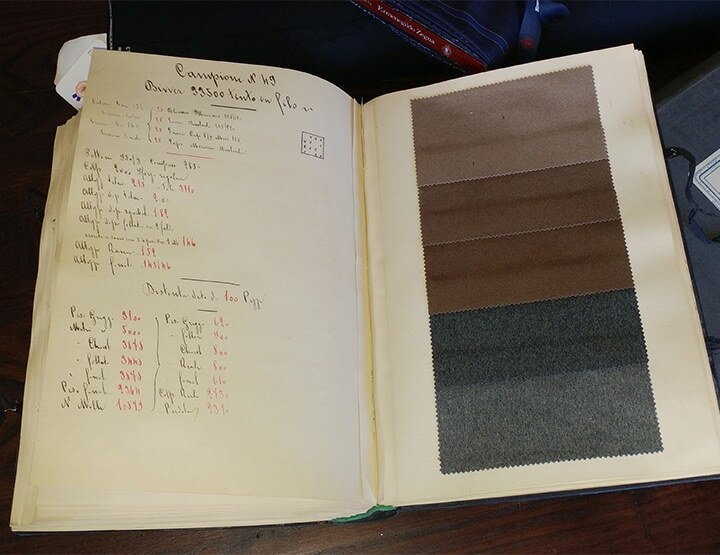 But in practice, Zegna cloths were well assorted and never banal in their colors, and made with excellent yarns (carded and combed, between 2/28 and 2/80) from good raw material. 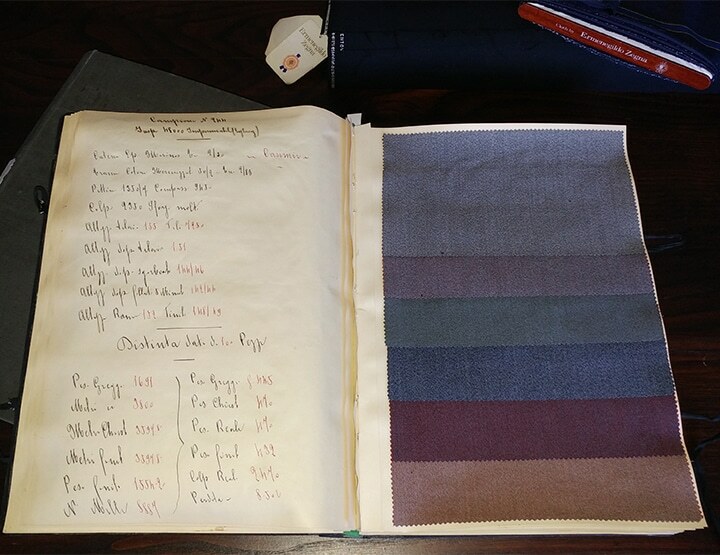 They were then finished with techniques that gave Zegna fabrics their unmistakable quality. Alongside the casimirs there are also some canvases (265 grams a meter), but Ermenegildo Zegna focused not so much on the complication of passes between warp and weft but on patterned effects (as in the splendid 420 gram gabardines), color (see the 50% cotton jaspés, indicated as "waterproof" and "tailoring exclusives") and above all finishing. In vogue in the years 1928-1930 were foulés (600 gram) and beavers, yarn-dyed and nicely soft despite their 890 grams, meltons and vigognes (nothing to do with vicuña, a bit rough and made with merino lap and Cape wool). And the paletots of course: 770 gram tartans woven with Argentinian wool and 920 gram velours (carded yarn), whose durability was ensured by the 30% of Puglia wool in the mixes). Same weaves then, and same yarns and patterns. Yet it was all different because wholesalers or tailors keen to stand out could buy not an anonymous cloth to pass off as Made in England but a real fabric from a real Biellese wool mill that dared assert Zegna quality (not without problems, even from those, like Laniera, which should have supported the initiative rather than hindering it) with a star brand, meaning good to…wear.